Support me on Patreon if you can! 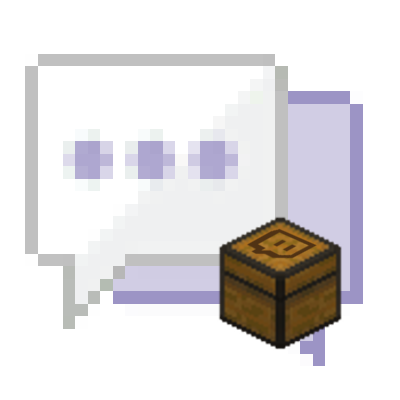 This is a module for ChatTweaks that will allow you to bring Twitch chat into your Minecraft chat. It's a great way of keeping track of chat while playing or just bragging to your viewers about how cool it is that they appear within Minecraft. In order to get started, open the mod config GUI or press the "..." button at the bottom right of chat. You will find your way from there. Emotes in messages will display as images in chat. BetterTTV emotes are supported as well (as part of Chat Tweaks). FrankerFaceZ emotes are supported as well (as part of Chat Tweaks). Supports both Twitch's standard name badges for moderators and such, as well as subscriber badges (and those new bit badges). Does not support BetterTTV badges because they rejected my emote once and I hate them now. Not just the sixteen Minecraft colors. We're talking RGB name colors here. Optional of course. Needs to be enabled in the settings. It's a neat thing for the non-streamers using this mod though. For when you're too cool to have normal peasants show up in chat. May help with too much chat overlay on bigger channels. Copy & Paste these links into your browser. Once downloaded, put these files into a folder so you can keep track of them during the installation process. Please follow the installation steps in order. (a): Double-click on the forge installer application. The installer will prompt you with a window - click on "OK" ensuring that client is selected. (b): Open the Minecraft Launcher but do not click on "PLAY" yet. Click "LAUNCH OPTIONS" - "ADD NEW" - click on "VERSION" and scroll through the options to the bottom where you will see "release 1.12.2-forge etc." (d): Click on either "NEWS, SKINS, OR SETTINGS". (e): Right next to the play button is an upwards facing arrow. Click on this and scroll until you see the "1.12.2-forge etc." and then select it. Now you may click on "PLAY"
(f): After Minecraft has successfully launched you may now close it to install mods into the folder. (a): In your windows search bar enter in "RUN". Choose the application that pops up. Alternatively, press the windows icon and "R" on your keyboard at the same time. (c): You should have a folder in there that says "mods", if not you can simply create a new folder by right clicking in an empty space and selecting new, and hovering your mouse over to folder. (d): Now drag all three mods (Optifine, Chat Tweaks, and Twitch Chat Integration) into the folder. (e): You may now close out of the windows explorer search directory (A.K.A the folder where we just placed the mods). (a): Open your Minecraft launcher and click "PLAY"
(b): Once Minecraft has successfully opened you will see the main screen. Click on the "MODS" button. (c): Scroll down the mods list until you see the two mods Chat Tweaks and Twitch Integration. (d): First, click on the Twitch Integration mod and "CONFIG". (e): Click on the green text that says "CONNECT". If you have not authenticated your twitch channel to be integrated with the mod then you should Click on "EDIT/ADD AUTHENTICATION"
(f): Click on the green text that says "GENERATE TOKEN". Click on "OPEN IN BROWSER". Once the webpage is opened in your browser click on "AUTHORIZE". Go back into Minecraft and your TOKEN will show up as asterisks (*). Click "CONNECT". Now your green connect text will have changed into disconnect indicating that you are connected. (g): Next click on "CHANNELS". Click on the green plus button, enter your twitch username where it says "NAME", and you can choose the options for how you want to see deleted messages (SHOWN, STRIKETHROUGH, REPLACED, OR HID). Click "DONE" when finished. You can choose to show NAME BADGES and NAME COLORS of your twitch users in the chat. Keep them "false" if you would like them to show. (h): Click done and now click on the "Chat Tweaks" Mod. Once again, press config. (j): Now at the bottom (under exclusive, muted etc.) click on "CHANNELS". Click on the arrow and make sure all of the items "death, interaction, main, (your channel), and system" are all to the RIGHT where it says SELECTED!!! Click done, and done once more. (k): This step is optional if you would like to have the emotes take up less of the screen. If so, click on "GENERAL" and go to the "SMALLER EMOTES". Click on true if you would like them, and false if not. 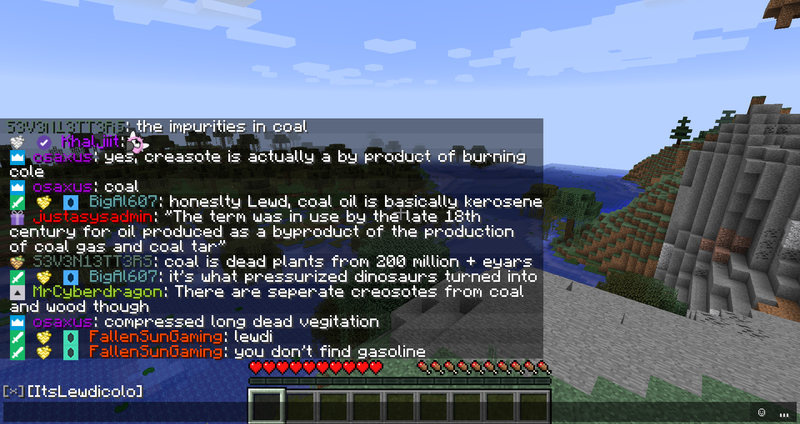 (l): Keep clicking the done button until you are at the main screen of Minecraft. You have now completed the installation of these mods. 1. Go to the folder where the Modpack instance is located. 4. Extract the contents for .jar. 6. Pack it back into a .jar without changing the name. MineTogether is optional on both client and server (at least in latest versions), so you should just be able to delete it from your client altogether. Is there a version for 1.7.10? When will you add 1.13? Minecraft Forge has not released for 1.13 yet. a video would be really helpfull i have no idea what i put in for the chat token it makes me auth it with twitch then brings me to an error screen with the Url localhost: . . . . ect. If the authentication button is failing for you (usually it should tell you about it ingame), you can manually create a token at https://twitchapps.com/tmi/ and paste that into the box. does it support blacklisting of names? Like say being able to blacklist Nightbot or other bots from showing up in the MC chat? That's been added in the latest version under the "User Blacklist" option. I must admit I have no idea how the Twitch chat works with channels. If I just stream on Twitch, the default chat, what's it called? It will be your lowercase Twitch username then. Using the ingame authentication GUI should set it up for you automatically. Ok. Just the "channel" that was the big questionmark for me since it was empty while all the rest was setup. But maybe supposed to be, or not lol. Will try with my username as well. I am having a problem where I cant see the chat from twitch to game but i can type in game and it goes to twitch. The Twitch chat and the in-game Minecraft craft display separately, toggled by alternately clicking on the "[x] [PlayerName]" label. Is there a way to get both to show at the same time? Optionally also set the existing Twitch view to muted so it doesn't get the red highlight on new messages, or set it to Message Style: Hidden to get rid of it.